The Jousting Life: The Ladies of the Lysts: Female Jousters Are Making Their Presence Known at this Year's "Lysts on the Lake"
The Ladies of the Lysts: Female Jousters Are Making Their Presence Known at this Year's "Lysts on the Lake"
There are twelve women competing in this year's "Lysts on the Lakes". That is more female competitors than there are competitors at many jousting tournaments. There are a total of 45 competitors at this year's tournament, which means that women form more than one quarter of the total competitors. That is a a pretty significant percentage of feminine participants for a sport generally thought to be almost exclusively masculine. For a few of these females, jousting is still a fairly new experience, and they don't expect to necessarily do very well in the standings. This will be the first time Lady of Honour Dawn Hemphill will actually be competing in any tournament, and she will only be participating in the Mounted Skill at Arms(MSA) portion of the tournament. 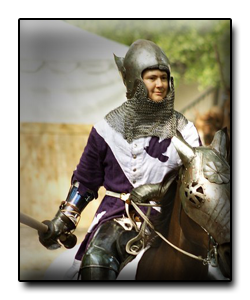 For other competitors, such as Sarah Hay from Australia, who will be competing in the Melee a'Cheval as well as the Joust a'Plaisance, there is a chance she could win the entire tournament. She just recently won the Australian National Jousting Championship, and she has won at least six other jousting tournaments in the past few years. However, whatever the final standings are, simply by showing up to compete, the women competitors at "Lysts on the Lake 2012" are challenging the assumption that jousting is a "man's sport". "Alison started with historical equestrianism back in University, studying the equitation and weaponry of Alexander the Great's cavalry and the horsemanship of the Red River Mètis in the mounted buffalo hunt. After doing an MA in Canadian Military History in 2008, she decided academia didn't pay enough and got a job instead. She now works as the curator at the Air Force Museum of Alberta. Having been a history buff and a re-enactor for years, Alison decided to give jousting a go, feeling it was a more authentic form of living history since the hits are real. She is particularly keen on the history of the joust in the court of Maximilian I. Lysts on the Lake will be her first international tournament and she is thrilled to be riding against and learning from the established 'pros.'" "Bobbie Patterson has loved horses all her life and this love has carried over into many different aspects of horse activities. She has shown horses for over 30 years and trained for more than 20. She loves all horse breeds and never could pick just one. At present she has over 10 breeds at her East Texas ranch. Her love has been passed onto her two sons, Steve and Dusty Martel, who also are here at Lysts on the Lake and the reason for her involvement in jousting. She has been involved in the training of the joust horses in the Order of the Argent Spur and has personally participated at Skill at Arms for 8 years." "Dawn begged her parents for a pony as a little girl, but never got one. As an adult, she was finally able to fulfill her dream and started riding 10 years ago. 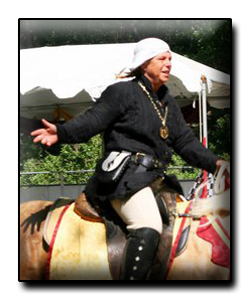 Since then, along with her husband Steve, she has been instrumental in promoting jousting as a sport in North America. Dawn was the Lady of Honour at last year’s Lysts and is repeating the role this year. When not watching knights in shining armour, she competes in dressage and eventing on her Quarter Horse, Chocolate Moose. Dawn is also on the Board of Directors for The Baron’s Men, an Austin-based theatre company focusing on pre-17th century plays, allowing her to exercise her award-winning costuming skills. Additionally, she is a designer for a local home builder." "Kellyn has been riding and showing horses since childhood, and started her career as a professional trainer in 2000. She has always valued versatility in riding, and has competed in various equestrian sports including jumping, eventing, dressage, western pleasure, barrel racing and driving. She sees jousting as a new and exciting discipline for her and her horse to explore." "Kristen is a native Texan and currently resides in Cut n' Shoot Texas. She earned a degree in Wildlife/Fisheries and Animal Science from Texas A&M University and works in a small and large animal veterinary clinic. She has been an active member of the SCA for 20 years and the last 5 has been spent with horses and medieval games. She has ridden horses all her life, with different types of riding instruction, and enjoys riding many types of horses in many environments." "Nikki is a member of, and US Liaison to, the International Jousting Association (IJA) (www.ija-usa.com), a co-founder of the New England Jousting Association (NEJA) and the Academy of Knightly Arts. Nikki competes in events with the IJA, NEJA, Society for Creative Anachronism (SCA), and International Jousting League (IJL). She rides a 19.1, 8 Year old Percheron, Grassy Notch Thunder Ripper. AKA Thunder, a big horse with a big heart. Professionally she is a desk jockey, Sr.V.P of a technology division for the financial services industry. Jousting and Sword fighting have proven to be great stress management tools in her life." Motto: Girls JOUST wanna have fun! "Radar originally trained with the “Freelancers” jousting team lead by Roy Cox Team and debuted in Waxahachie, Texas at Scarborough Fair April 2003. She is the founder of the Society of Tilt and Lance Cavalry, founder and competitor at the Calgary Stampede Sheridan Hughes Memorial Tournament 2005 (At the time, the biggest international Tournament held in North America), joust team leader, competed from Estes Park Colorado (three times) to London Ontario, Renaissance Faires from Langley BC to Winnipeg Manitoba. Her goal is to joust in Europe and Australia over the next two years. Her degree is in prehistoric Archeology, she's a Certified Fire Service Technician (Firefighter), Fire Service Instructor and jousting enthusiast." Height: 5'0" Weight: 155 lbs. "Originally from Torrance California, Robin came to Texas as soon as she could! She has competed in Polo Crosse for 16 years and is currently still umpiring for the sport. She has been involved in the Society for Creative Anachronism, Inc. (the world’s largest historical medieval living history organization) since 2010 and holds 4 equestrian championships within the organization. She has been married for 33 years and has 2 children. Aside from horses, she loves everything Disney!" "Samantha has been riding for the past several years. Although a late comer to horses she immediately developed a passion for riding, and is often found jumping, running barrels, working with new horses or on the trail. In 2010 Samantha was asked to assist in training horses for jousting and from the moment she mounted in armor she knew she had to compete." Height: 5'6" Weight: 140 lbs. "Sarah lives on a farm in the outskits of Sydney, Australia. She currently looks after a team of 11 horses. Sarah has ridden all her life across a range of disciplines, but now dedicates her riding to jousting and horse archery. Sarah has been enjoying competing internationally for two years. She rides in a 1450s spring steel English harness made by an Australian armourer." "Theresa Wendland is a horsewoman, scholar of the Chicago Swordplay Guild and member of the Rocky Mountain Swordplay Guild. She has been riding horses for over twenty years, focusing mostly on classical dressage. She has been working to combine her knowledge of horsemanship, of the biomechanics of riding and of equine behavior with the practice of western martial arts to interpret and reconstruct mounted combat, including wrestling, sword and spear from horseback. Theresa has been extensively researching historical horsemanship and mounted combat with a focus on the Italian and German medieval fighting manuscripts of the 14th and 15th centuries. In addition to her studies of mounted combat, she has recently begun to learn to joust." Motto: We are the Music Makers and We are the Dreamers of Dreams. "Still a West Texas girl, Tiffany has always been a tomboy and very active in life. On top of being a proud mother of 2 children, Alex and Caylie, she is a seamstress, tiler, manager, and a jack of many trades. 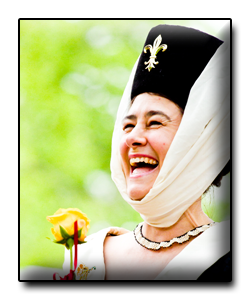 She served two reigns as Queen of Ansteorra (Texas and Oklahoma) in the Society for Creative Anachronism, Inc. (the world’s largest historical medieval living history organization) and 8 years ago, became the 23rd female to achieve knighthood within the society over its 38 years of history. Thanks to a wonderful horse name Plum, she overcame her fear of horses and now after a physically challenging two years, is looking forward to the continuance of her quest to hone her equestrian skills and living her love of the beauty of the joust and melee a' cheval. Ah, to live life to the fullest!"